Historic Fall Creek, Pendleton Settlement, Inc. The purpose is to preserve and protect historic buildings and building and educational projects related to preservation and restoration. Our membership is open to all who are interested in this type of work. We meet on the second Monday every other month at member homes. For more information, please contact Chairperson Sandy Butler at (765) 778-4534. The Society meets on the last Thursday of each month at 6 p.m., April through October, at the Dr. Joel Cook Building(Orestes Museum) in downtown Orestes. For more information, please call President, Carolyn Shettle at (765) 754-8893, Orestes Historical Society, P. O. Box 155, Orestes, Indiana 46063 or Dr. Joel Cook & Orestes Museum, P. O. Box 155, Orestes, Indiana. A tour of the museum is by appointment only. Call (765)754-8893 for Carolyn. 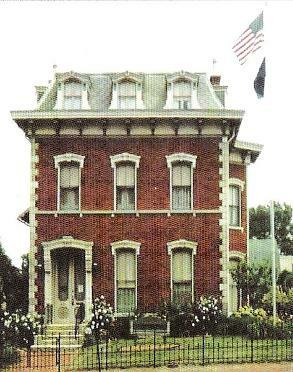 The home is located at 626 Main Street, Anderson, Indiana 46016. It is open by appointment only. Events include Festival of Trees, Winter Fest, Jewelry Show and Sale, and the Wine Gala. Watch for announcements in the newspaper. For an appointment and more information, please call (765) 648-6875. The 1908 Anderson Car is on display in the main lobby of the Madison County History Center, 11 West 11th Street, Anderson, Indiana. The Anderson car was built by the Anderson Carriage Manufacturing Company, located at the time at 25th and Walton Street. Only about 200 cars were manufactured in 1908 and 1909. It is powered by a 14 horsepower, 2 cylinder engine with a top speed of 30 mph. 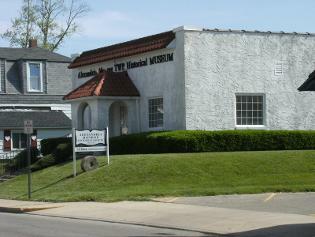 The Anderson car is on loan from Mr. Joe McClain of the Historical Military Armor Museum, 2330 Crystal Street(east of North Broadway), Anderson, Indiana. MCHS members, sponsors and the general public are welcome and invited to view the car any Monday, Wednesday and Friday, 9 a.m. to 4 p.m. The trolley above is totally electric. A charge lasts about three days and has good pick up from a complete stop. The trolley is operated by the Anderson City Transit. The trolley runs downtown Anderson on Meridian, Jackson and Main Streets between 10:30 a.m. to 2 p.m. It will pick you up anywhere; just wave it down and you can ride for free. The downtown route takes about 22 minutes and stops at the C.A.T.S. Terminal on Main Street for Sandy, the driver, to stretch her legs. The Hibbs Bridge - The Parker Truss was built in 1903 by the Attica Bridge Company over the Coal Creek in Fountain County, Indiana, about 100 miles west of Anderson. The Parker Truss was designed and patented(patent#100,185) by Charles H. Parker on February 22, 1870. 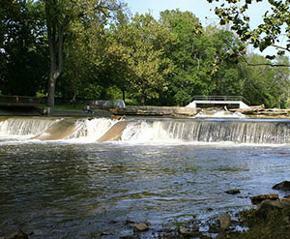 His innovation was to angle end-posts and arched segments spanning the top of the bridge for better stress management. The bridge may be old but has been put to another use in Anderson. It now spans the White River just about one block south of the Eisenhower Bridge and connects two park areas by footpaths on the west and east. It is a wonderful view of the river and downtown Anderson. Old building in Alexandria, Indiana along Harrison Street. Perry Heritage block built in 1902. 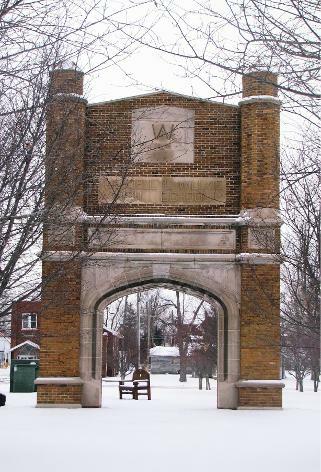 This is the front entrance to the Wendell Willkie High School. The school had gone through many changes through the years. Before being taken down, it had been the Junior High School. 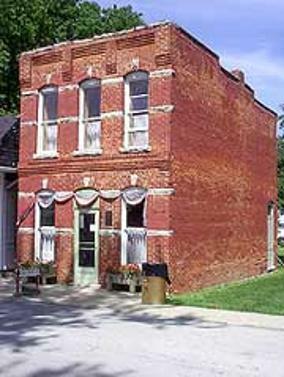 This part of the building was saved to commemorate the life and accomplishments of one of Elwood's leading citizens, Wendell L. Willkie.